It’s a bird, it’s a plane… it’s an ordinary man dressed as Superman? No, it’s not Halloween, in documentary filmmaker Matthew Ogens’ Confessions of a Superhero, every day it’s a costume party for a surprising number of individuals who work the Hollywood Walk of Fame sidewalk outside Groumann’s Chinese Theatre and, dressed as their favorite film characters, take pictures with tourists for tips. Is this legal and how is it different from ordinary panhandling? The honorary mayor wants them thrown out and Graumann’s has set up a sign informing passersby that they are not affiliated with these “characters” who the chamber of tourism say are "Ambassadors of Hollywood Boulevard" and while occasionally a few get arrested for aggressive begging or solicitation, most follow the set rules. To explain, there are legal rules that state that the characters aren’t allowed to name dollar amounts, solicit photos, can’t demand a tip nor make contact first with tourists for the purpose of a transaction and then there are the unwritten code of conduct rules that some of the characters try to live by such as the boulevard’s unofficial leader Superman (real name: Christopher Dennis) who tries to show a newbie the ropes by explaining that, although they can smoke in private, they maintain an image as superheroes and can’t smoke in public. It’s a convincing and honorable argument that is somewhat diminished by the arrival of an aggressive female fan who seems to have a groupie-like Superman fetish who asks a friend to help her pose for a photo with Dennis before groping him without a word and passing him along an unknown amount of money. Just what is it that makes the four individuals (Superman, Hulk, Batman, Wonder Woman) decide to go through this strange ritual of hairspray, costuming, and characterization everyday? Well, aside from the money which has them raking in hundreds on a particularly good afternoon, it’s the same reason everyone goes to Hollywood which is the prospect of possible fame and fortune. Not only are they selling themselves to the public but as a city official notes early in the documentary, they’re also trying to sell themselves to producers, directors, and any other people walking by who may be ready to offer them their big break. It seems like an unlikely way to attract any serious consideration from someone in the industry and while some definitely stare at the characters as if they were freaks and a few try to suggest that Batman and Superman should fight, stranger things have happened in Hollywood and the four keep pounding the pavement. An official selection at the 2007 South By Southwest Film Festival, Confessions of a Superhero which has been presented on DVD by Morgan Spurlock (Super Size Me), takes what could very well have been a campy or laughable treatment of its subjects by creating an honest, straightforward look at the lives of the individuals as we try and ascertain just what makes them do what they do each day. In the process we uncover some deep melancholy truths and difficult pasts but are constantly reminded of the filmmaker’s respect and humanity for the subjects by refusing to cut things in a ridiculous way and just let it play out naturally. Along with Christopher Dennis, who is the son of the Oscar winning actress Sandy Dennis who lives in a shrine to all things Superman and dates a Ph.D psychology student, we meet Jennifer Gerht’s Wonder Woman a.k.a. the beautiful homecoming queen who loathed high school and graduated early only to flee her small town and head for Los Angeles in the hopes of a better future and the Hulk’s Joseph McQueen who was homeless for a few years and is searching for his big break. Perhaps the film’s most fascinating and mysterious figure is the troubled George Clooney look-alike Maxwell Allen who in between working as Batman on the boulevard suffers from a tendency towards rage that’s balanced by his loving relationship with his disabled wife who likes telling others she’s not only married to Batman, but also to someone who looks like Clooney. 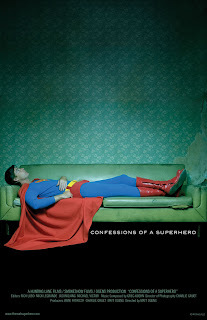 Far more compelling than one would expect given the sort of strange curiosity it solicits in viewers from the start, Confessions of a Superhero is a bold documentary sure to entertain and spark good discussion on the nature of celebrity, pop culture, and Hollywood and the best part is that we don’t have to snap a photo or get ready to tip a stranger to enjoy it. In other words, that’s leaping several obstacles in a single bound.